The big day – Christmas – is just four days away! Ask me if I have everything done. Go ahead. But be ready for the glare that comes back your way :-) No, just like most everyone else I’m still running around like a crazy person trying to finish all the hundreds of little tasks that have to be completed by next week. And loving every minute of it. Really. I am. During this time of craziness, it’s really comforting to know that you have recipes that are quick to make when friends stop by or to take with you to holiday parties. 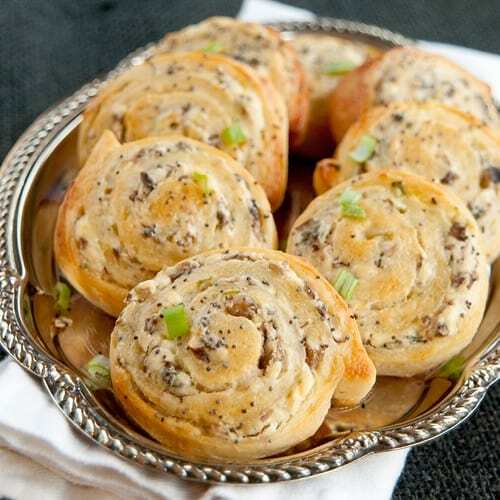 And these Cheesy Mushroom Pinwheels appetizer couldn’t be easier or tastier. It’s loaded with cream cheese and mushrooms and made even easier by using one of Pillsbury’s refrigerated pizza crusts. All you do is chop up some mushrooms and green onions very finely. Then you cook those for a little while in a bit of butter. 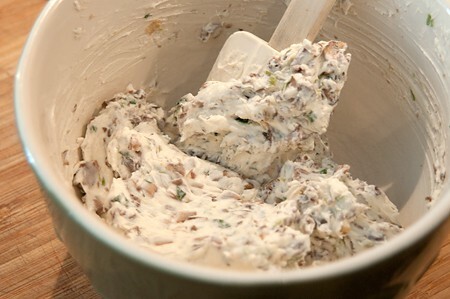 Let that mixture cool and then combine it with some softened cream cheese. roll the whole thing up and cut it into slices. 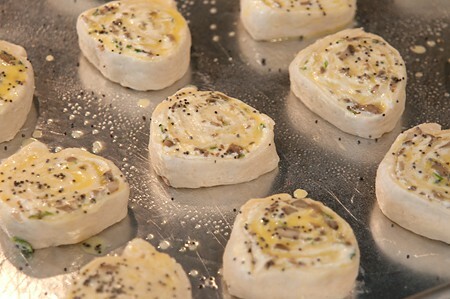 Put the slices on a greased baking sheet, brush them with egg wash and sprinkle them with poppy seeds. Pop the baking sheet in the oven and cook until golden brown. You can serve these little gems either warm or at room temperature. They’re great with a glass of wine or whatever your libation of choice might be. Note: I am required by FTC rules to disclose that I will receive compensation from General Mills for this post. However, all opinions are strictly my own. Always have been. Always will be. An easy hors d'oevure for Christmas or New Year's parties. 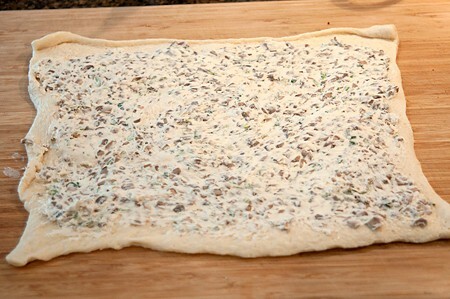 Sauteed mushrooms and green onions combined with cream cheese all wrapped up in a refrigerated pizza crust. 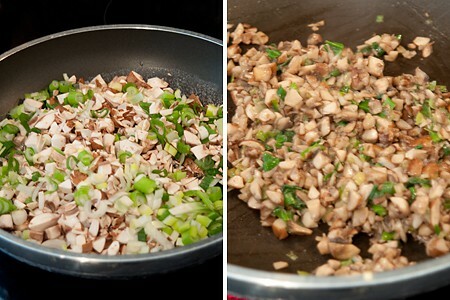 Cook the mushrooms and green onions in butter until softened. Allow to cool for a few minutes, then combine with the cream cheese and salt in a small bowl. Spread the cheese-mushroom filling over the pizza crust. 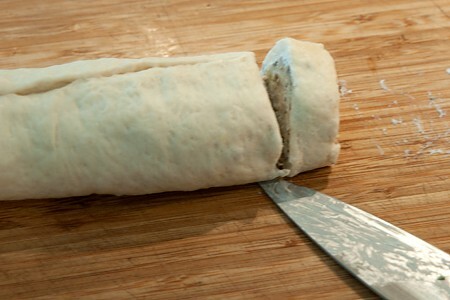 Roll the pizza crust from the long side pinching the ends to seal. Cut the roll into 1/2-inch slices and place on a baking sheet coated with cooking spray. 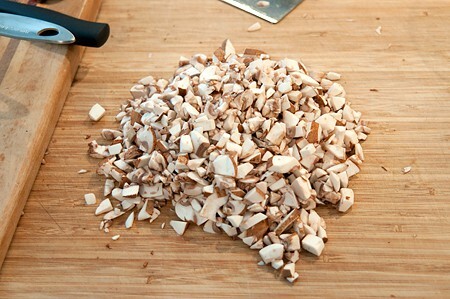 Combine the egg with water in a small bowl and brush over each slice. Sprinkle with poppy seeds. Bake at 400 degrees 10-12 minutes or until golden brown. Remove to a baking sheet to cool. Serve warm or at room temperature. Big mistake to come here before coffee or toast; dying for some for breakfast. They sound easy to make and delicious too…how perfect is that? You know, Barb…these would actually be great with breakfast or brunch. Cream cheese, mushrooms and pastry. How can you go wrong? A fantastic recipe! I’ll be trying these for breakfast, for appetizers and as holiday snacks! Who could resist?! Thanks for sharing!! Thanks, Shannon. Hope you like them. We certainly do! I will be making some of these to have in the fridge & pop in the oven when folks come by over the next few days. Now, if there was just a way to make my house clean this easily……. well.. I LOVE this recipe :) So easy and chic Lana! Thanks, Aly. Hope you’ll try it and enjoy it! Happy Holidays to you! delicious :) found you on FB. Great! Hope you’ll visit again. Anything with mushrooms we love here.. this is one recipe will be trying out this holiday week, but will make my own pizza dough..instead of using the dough you suggest.. Glad I discovered you today, what I have seen so far has been great. These look so delicious! I am obsessed with anything involves mushrooms and cheese and can’t wait to try these as the ultimate appetizer for my next dinner party. Yum! Really hope you enjoy these, Kelly. They’re quick, easy, and really delicious. I’m going to make these for part 2 of my fiance and I’s valentine’s day! I love cooking so I’m making 3 courses the day after valentine’s day (since we’re going out for a romantic dinner on Friday!) Anyways! does anyone know if I can make these in advance (leave them on a baking sheet, cover & refrigerate) and just pop them in the oven when I’m ready? I’d like to get as much done ahead of time if possible. Thanks so much for the recipe! Can these be frozen then cooked? Debbie – sorry I can’t say since I’ve never tried that. However, I do know that cream cheese normally doesn’t freeze well, so I wouldn’t recommend it. Can I make them without egg as I want an egg free version?